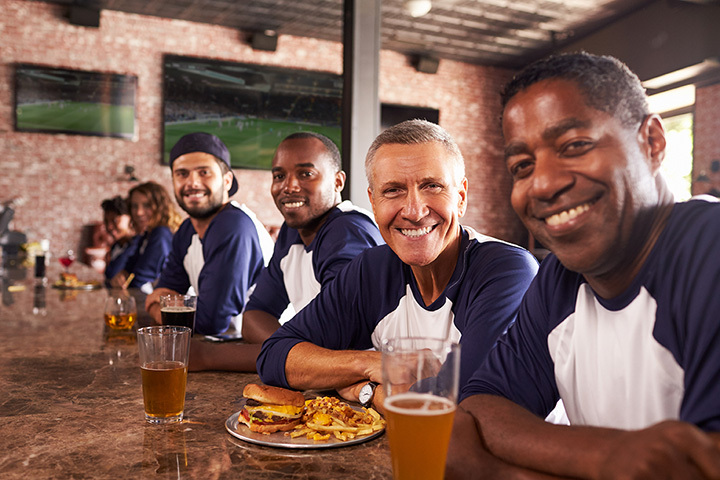 Given Florida’s epic sports fan base and variety of college and professional teams that call the Sunshine State home, there’s no surprise that Florida boasts some of the best sports bars in the country. Throughout the state, you’ll find some of the best food and coldest beer served by the friendliest bartenders anywhere. And best of all, you can enjoy it all while catching all the action from your favorite sports teams. Grab a seat and don your favorite sports team gear and enjoy a night at one of these 10 best sports bars in Florida. This multi-location Florida-only sports bar chain always has your favorite game on, and plenty of tasty eats to enjoy while you watch. All day every day is happy hour at Duffy’s, where they offer two-for-one specials on all their drinks—no hold backs. If you love sports, you’ll want to join the rewards program here for sweet discounts. Sports bar fans love the Dugout because of their reasonable prices and wide selection of IPAs. It’s a family owned and operated business and caters to sports-minded fans of all ages. Their menu is also one of the most diverse, a far cry from other sports bars. This all-American eatery has a lot going for it: trivia, live music, karaoke, pool tables, free Wi-Fi, three bars, and televisions galore. Every night is something special and unique, especially when a big game is on. They also feature over 75 beers and some of the best food in town—you’ll never look at bar food the same way again! This spot is a well-known hangout for Green Bay Packers’ fans, but you don’t have to shout Go Pack Go! to gain entry. They’ll gladly welcome any sports fan into their clean, spacious digs, complete with a multitude of screens on every wall. They’re also proud of their large selection of food items that will leave your appetite wanting for nothing. There aren’t many places that can double as an upscale sports bar and boozy brunch hot spot, but American Social does it with ease. In addition to its stylish fineries and numerous big screens, AMSO specializes in American comfort foods, bottomless mimosas, and some of the finest brunch on the beach. If you can’t bring your friends with you, you’re guaranteed to make new ones here. An Irish pub and sports bar rolled into one, this is the place to be on Football Sundays. With 16 screens, you never have to miss a moment of your favorite team. They also have a delectable food menu that will make you forget you’re in a sports bar. This pool hall has so much more to offer than billiards. This throwback game house has all your favorites from your childhood, including skee-ball, Pac Man, Atari Flashback, board games, darts, and other activities while you’re waiting for your favorite team to take the screen on one of their 15 televisions. Game days are special days at Flanagan’s. They offer some of the best sports coverage you can find, along with food and drink specials that won’t bankrupt your wallet. You can be sure to catch all your favorite teams here. If you’re looking for a neighborhood sports bar that treats you like family, you’ll find it here. This family-friendly eatery has everything the sports fan needs to enjoy the game, complete with some of the best service and tastiest food around. Just because the game is over doesn’t mean the party has to stop. Mike’s at Venetia knows how to keep the team spirit flowing long after the whistle blows, serving up food and fun until 3 a.m. Located on the 9th floor of the Venetia, this out-of-the-way place makes the perfect spot to enjoy the game.